Author Starbright Floral Design of NYCPosted on July 30, 2015 Categories All About Starbright, Event Decor, Flowers as Gifts, Seasons, Thoughts and IdeasTags Flower Delivery NYC, Flower Show, Macy's, Starbright Floral DesignLeave a comment on NYC Flower Power – Happy Hour! 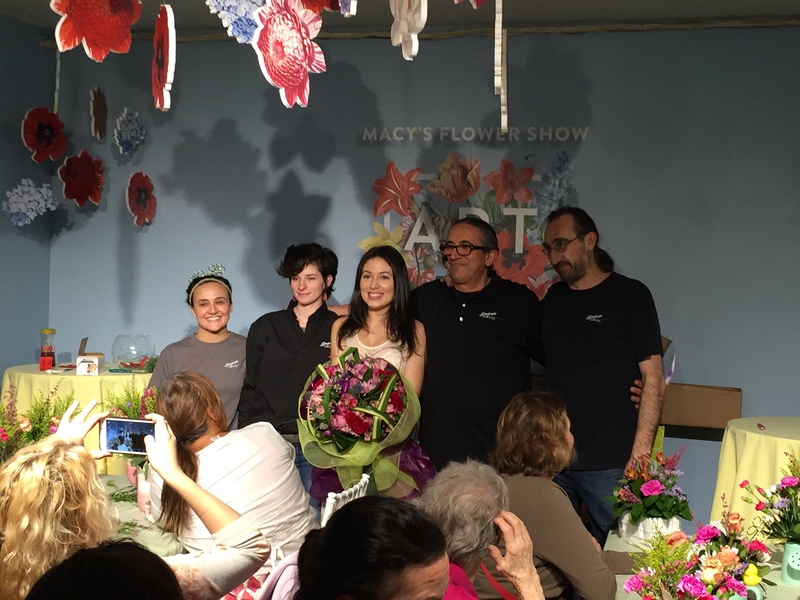 Our Creative Director at the Macy’s Flower Show! 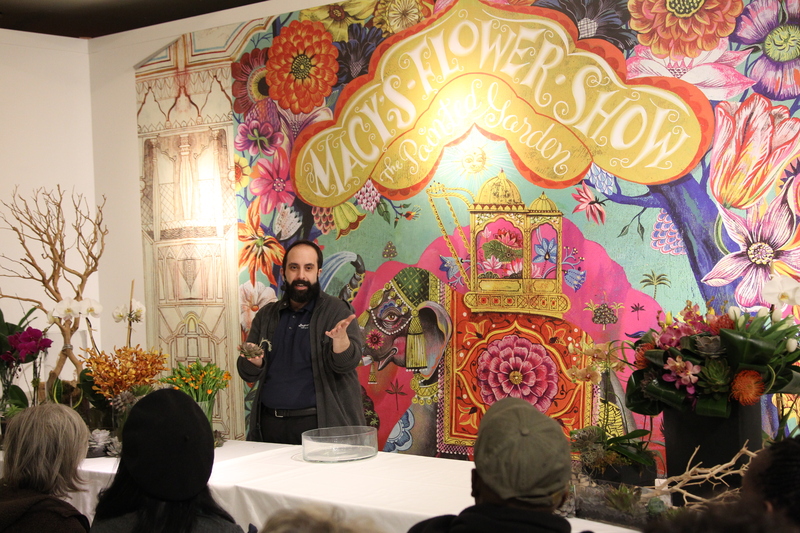 Tom Sebenius, Creative Director at Starbright Floral Design at the Macy’s Flower Show. For 39 years, Macy’s has welcomed spring with their annual Flower Show. A celebration of all the joy that flowers and plants bring to our lives, the Herald Square flagship store is decked to the gills with blooms and greens. This year’s event was themed, The Painted Garden and featured arrangements and displays of plants native to South Asia. The dramatic showpiece for this year was a life size elephant, elegantly draped with a blanket of flowering vegetation. The other highlight of the Flower Show was the second appearance of Starbright Floral Design. 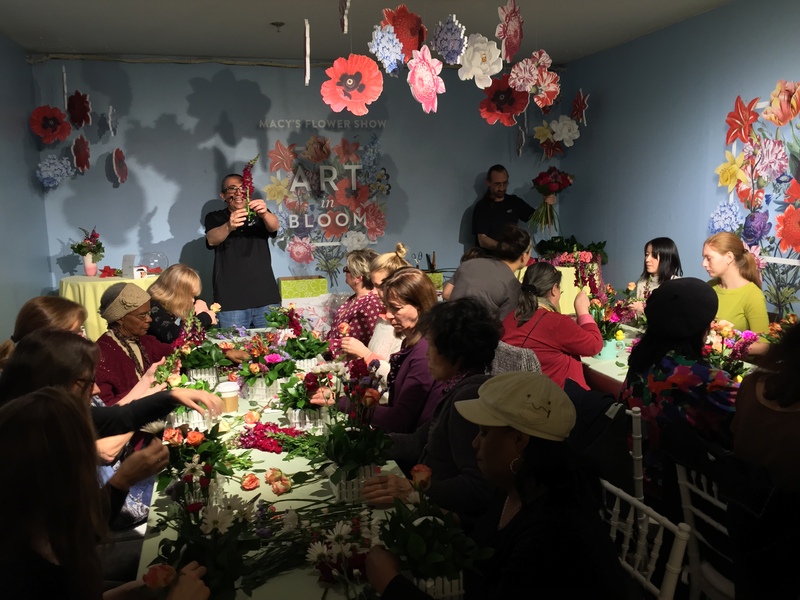 We were thrilled to be asked again this year to participate in one of the live floral design demonstration given throughout the two week long show. Starbright’s resident performer/designer, Tom Sebenius lent his flair for the dramatic once again to the cause. This year’s selected topic was succulents. 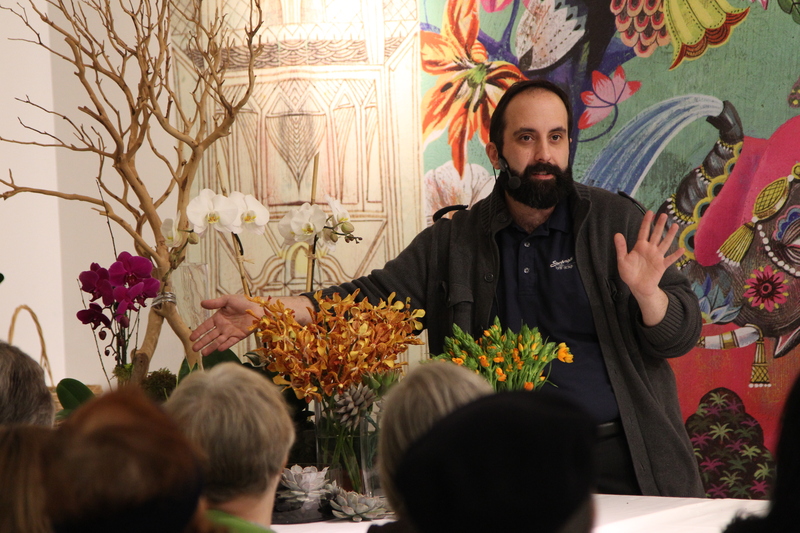 Tom is demonstrating different floral varieties and how we use them at Starbright Floral Design. 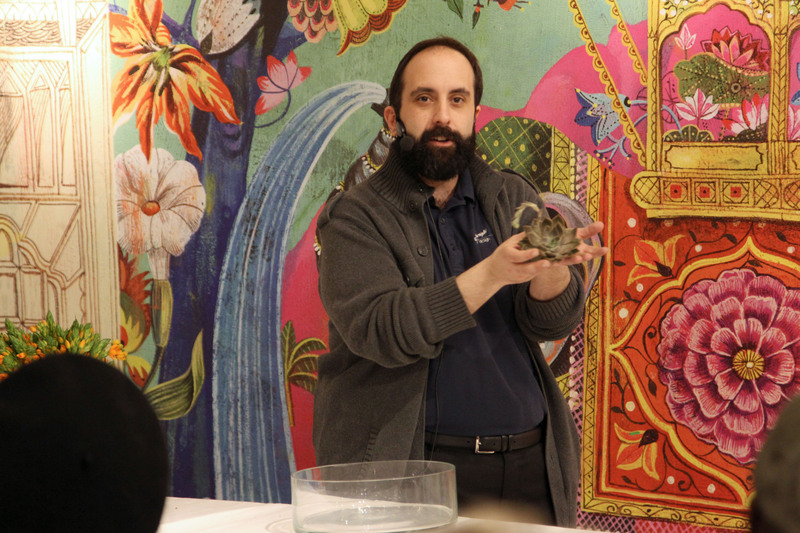 Tom demonstrated how to make a desert inspired planted garden to a knowledge hungry crowd gathered in the Fine China department on the eight floor of Macy’s. Showing how sand, moss and stones will complement the strong and bold architecture of the unique succulents, Tom explained that succulents have become increasingly popular among Starbright customers. Because the Flower Show is a celebration of spring, Tom also demonstrated how he often includes succulents in wedding flowers. Much to the delight of the attendants, Tom fashioned a chic and modern bridal bouquet using orchids, arabicum, folded leaves and succulents that he showed how to wire and tape appropriately. 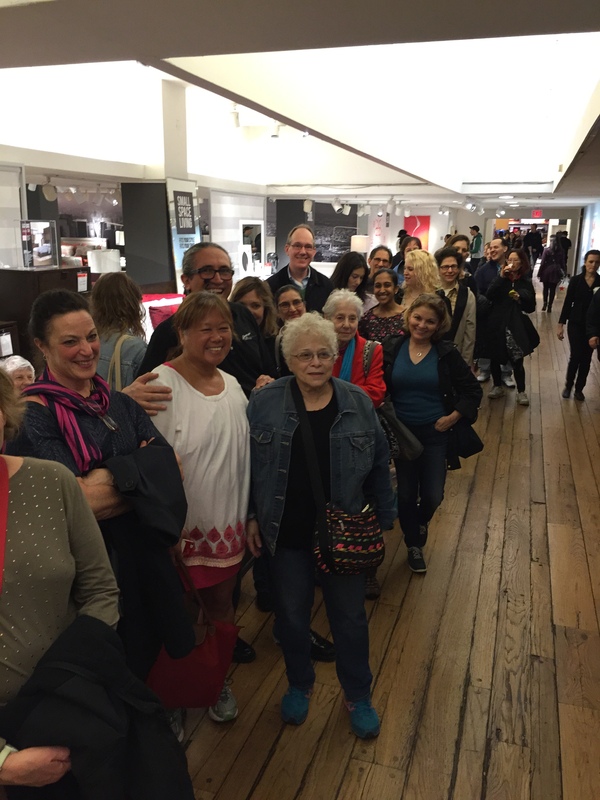 Macy’s has long been a mainstay of both New York City and America at large. We are proud to have been included in their majestic and spectacular floral extravaganza. Not only does Starbright appreciate being included in this long standing New York tradition, but we also join Macy’s in welcoming spring and saying thank you to the flora that makes this season sing! Creating a magical garden of succulents before everyone’s eyes! Author Starbright Floral Design of NYCPosted on April 16, 2013 April 16, 2013 Categories All About Starbright, Event Decor, Flowers as Gifts, Seasons, Thoughts and IdeasTags Flower Delivery NYC, Flower Gifts, Flower Show, Macy's, Starbright Floral DesignLeave a comment on Our Creative Director at the Macy’s Flower Show!